You may have used peppermint oil as a flavoring in desserts and smoothies or simply as an aromatic, but did you know that delicious, fresh-smelling peppermint oil is actually a near-miracle remedy, with a host of surprising uses? Peppermint contains myriad essential nutrients and minerals, including iron, potassium, calcium, magnesium, vitamins A and C and omega-3 fatty acids. Organic Facts and Dr. Axe have listed a number of benefits of peppermint oil, when applied topically or taken as a supplement. WebMD notes that while some uses of peppermint oil have proven benefits, many natural remedies attributed to peppermint have yet to be substantiated. Still, the purported benefits of peppermint oil, for body and mind, are almost endless. Some sources even attribute it with aphrodisiac qualities! 1. Indigestion and stomach: Peppermint is an antispasmodic, and Organic Facts says it can reduce bloating and gas and improve digestion. 2. Dental care: Its fresh and antimicrobial properties make it the ideal breath freshener, with cavity-fighting properties. 3. Nail and hair care: It stimulates blood circulation around your scalp and cuticles, according to Organic facts, which can help thicken and strengthen hair and nails. Try it as a remedy for dandruff. 4. Headache: Peppermint might help improve circulation and relax the muscles. Apply it to your temples to combat headaches and migraine. 5. Nausea: Added to water or placed behind the ears, peppermint oil can provide instant relief from postnatal nausea or nausea caused by chemotherapy and surgery. 6. Respiratory problems: Inhaling the diffused oil acts as an expectorant, unclogging sinuses and relieving sore throats and tight lungs. 7. 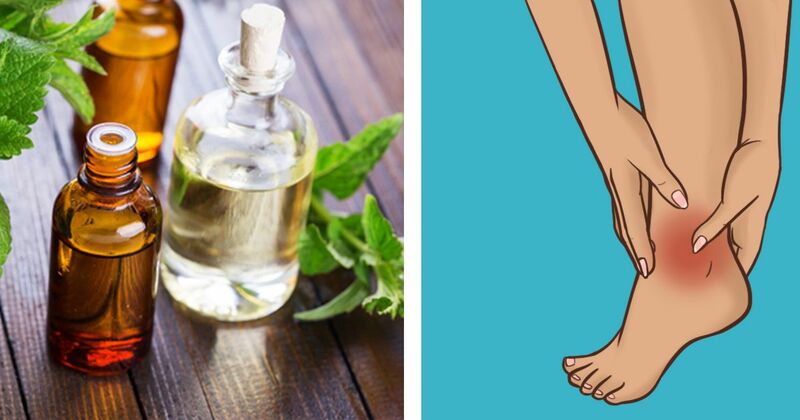 Muscle and joint pain: Applied topically in an ointment or added to your bath, peppermint oil can help relax muscles and relieve pain, according to Organic Facts. 8. Hunger cravings: Inhaling the oil might help curb cravings and help you to feel full faster. Apply a dash to your temples and chest for a long-lasting effect. 9. ADHD: Dr. Axe recommends spritzing it on your child's clothes to improve concentration and focus at study time. 10. Itches: Dr. Axe also suggests using peppermint oil to soothe itches, rashes, bug bites and red skin. Try it as a bug repellent in the process. Spiders absolutely hate it! 11. Acne: Its antimicrobial properties make it an effective ingredient in acne treatment when applied topically, according to Dr. Axe. 12. Irritable bowel syndrome: Studies published by NCBI have shown that, taken as a supplement, peppermint oil can reduce the unpleasant symptoms of IBS by up to 50 percent! 13. Colic: Peppermint oil is as effective in treating colic as some of the leading medications, according to Dr. Axe, without any of the side effects. 14. Cancer prevention: According to Dr. Axe, clinical studies show that the menthol in peppermint may inhibit the growth of prostate cancer cells. 15. Allergy relief: Inhaling peppermint aroma can relax your nasal muscles, soothing allergies and helping clear out pollen and other nasties.